Milk Products, maker of Sav-A-Caf® products, is excited to introduce the 2018 Sav-A-Caf® Youth Impact Award. This award will recognize two leaders who encourage learning and a passion for agriculture in their communities’ youth. Milk Products is expanding the award in 2018 because of the quality candidates who applied in 2017. 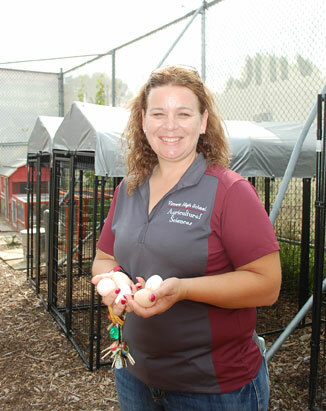 The winner of the first Sav-A-Caf® Youth Impact Award was Monica Gahan, animal science pathway teacher and FFA advisor at Vincent High School in Milwaukee, Wis. Gahan started an FFA program at the inner-city high school, giving students the opportunity to work with show animals, manage a business selling produce and learn about agriculture science. Prizes will be awarded to two agricultural leaders who will designate non-profit youth organizations to receive the awards. The first-place winner’s designated youth program will receive a $2,000 donation from Milk Products in addition to select Sav-A-Caf® branded products. The second-place nominee will receive $500 for his or her designated youth program as well as select Sav-A-Caf® branded products. Nominee must lead or be involved in a leadership role with a non-profit group focused on teaching youth about agriculture with an animal focus. Individuals may nominate themselves or others. Nominees must be 18 years or older at the time of application. Qualified applications will describe how the nominee has inspired youth to be passionate about agriculture. Qualified applications will affirm nominee’s innovative approaches to educating and inspiring youth engagement in agricultural projects with an animal focus. For more information about Sav-A-Caf®, visit savacaf.com or like My Farm Journey on Facebook. The Sav-A-Caf® brand is manufactured and marketed by Milk Products, based in Chilton, Wis. Milk Products manufacturers high-quality animal milk replacers and young animal health products. Using its innovative manufacturing technology, Milk Products produces over 700 unique animal nutrition products for numerous independent feed manufacturers, wholesale distributors and large retail chains. Our customers choose whether these products are sold under their private label brand, or under the Sav-A-Caf® brand.